She first joined BBC Scotland 10 years ago as a news trainee and, after the two year ‘on the job’ course, was appointed producer at 'Good Morning Scotland'. Working across GMS, 'Newsdrive' and 'Newsweek', Mhairi built up considerable experience of radio production, picking up a Sony award for GMS, and heading up many of the special productions such as election programmes and award-winning coverage of the Dunblane shootings. Mhairi has also presented the main news programmes on radio and recently fronted Radio Choice’s 'Newsline' programme on TV. The 1999 BT Scotland Radio Presenter of the Year is now on 'Scotland Live' as one of the main presenters. Born Glasgow, 1967 and educated at Cleveden Secondary School in the city’s West End, she then studied at Glasgow University and gained a Master of Arts Degree with Honours in Politics. Mhairi still lives locally with her husband, Rod, and family. Mhairi's main interests are skiing and sailing. 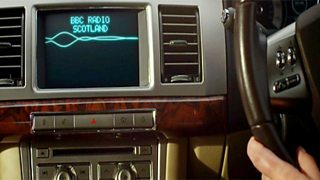 BBC Radio Scotland - television promotion.